A gang of thugs who 'completely destroyed' their victim's life are today starting long prison sentences. The group, who robbed a former teacher in his home and threatened him with a machete, have been jailed for a combined 37 years. Joshua Ireland, 26, Connor Osbourne, 20, Damien Meredith, 26, and a teenager who cannot be named at this stage, terrorised the “vulnerable” victim and threatened to stab him inside his flat in Barrowcliff. The teenage robber wielding the 14-inch machete told the victim that he would be stabbed if he didn’t keep quiet and follow orders, York Crown Court heard. deliberately targeted by the gang because of his vulnerability. He was told to sit on his settee and not to move during the terrifying ordeal in the early hours of July 19 last year, in which his beloved dog was so distressed it tried to get out of the flat. The victim was woken by repeated knocking at his door at about 2.45am. The interrogation lasted fully 30 minutes, during which Osbourne asked the victim if he wanted to sell his sound bar and one of the other thugs asked him if he had a pair of socks because “he was off to do something”. The victim thought the interrogation was over when the thugs got up to leave, but as he tried to close the door, Ireland forced his way back in and they sat back down on the settee. The “terrified” victim, who “felt his life was in danger”, was ordered to sit down on the settee and “keep quiet”, at which point the teenage robber whipped out a machete - which had a menacing inward curve “like a Gurkha knife” - from his tracksuit bottoms. “The victim tried to reason with them, asking them not to steal his possessions because it had taken him some time to save for them,” said Ms Addy. The 19-year-old man wielding the machete punched the victim in the face, causing cuts and bruising. The victim, who was “stunned” by the blow, had to have his wounds stitched and glued at hospital. 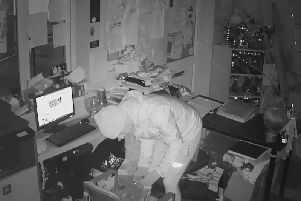 Two of the robbers bagged up the victim’s TV, sound bar, X-Box and three computer games before fleeing. The victim called police who searched the area and found Meredith in Bracken Hill. He was arrested and taken into custody. Osbourne and the teenager were found at a property in Oxcliff and arrested. Ireland was found in an upstairs room at his mother’s address. The court heart that Osbourne and Ireland knew the victim had mental-health problems and told officers he had “shot through”, but they denied the robbery. While Meredith was banged up in the cells, he defaced his bed by writing “I’m still robbing” on the mattress and pillow. The victim identified all four men in an ID parade, but although they were bang to rights, none of the stolen items was ever recovered. The victim said the gang’s evil acts had “completely destroyed” his life and he was now trying to leave Scarborough. robbery following a two-day trial. All four defendants appeared for sentence via video link on Thursday. The court heard that Ireland had 25 previous convictions for 35 offences including burglary, wounding, GBH, theft and aggravated vehicle-taking. Osbourne had previous convictions for affray and criminal damage. Meredith’s rap sheet included burglary, robbery, conspiracy to supply drugs, theft from the person and ABH. Defence counsel for the four men urged the judge to consider the defendants’ young ages and troubled histories. Meredith, of Springfield, Scarborough, was jailed for 11 years. The machete-wielding teenager, of no fixed address, was jailed for nine years. Ireland, of Woodland Place, Scarborough, was jailed for nine years. Osbourne, of Oxcliff, was jailed for eight-and-a-half years. The judge also imposed a restraining order on all four defendants, banning them from contacting the victim or going anywhere near his home for an indefinite period.